DES MOINES, IA - Head Coach and Director of Football Operations Mike Hohensee announced today that the Iowa Barnstormers have acquired fullback Cody Johnson from the Arizona Rattlers as well as future considerations in exchange for linebacker Darnell Carter. Johnson (5-11, 280, Texas) joins the Barnstormers after playing his rookie season with the Arizona Rattlers. Prior to his AFL debut, he was signed as an undrafted free agent with the Tampa Bay Buccaneers of the National Football League. 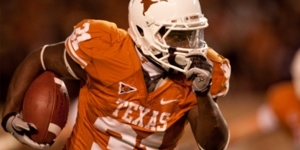 In 51 games as a Texas Longhorn, Johnson ended his collegiate football career ranked tied for fifth on UT's career rushing TDs list. The Iowa Barnstormers home opener is scheduled for April 12, 2014 against the San Antonio Talons. Season Tickets are already on sale for as litle as $110 per seat. Don't miss a minute of the action this season! To order your seats or for more information, please call the Barnstormers at (515) 633-2255, or log onto www.theiowabarnstormers.com.